The dangers of playing out in the street or in the park down the road, more and more people living in town houses or flats, more access to television, DVD’s and computers, longer working hours for parents and less play time for children all boil down to one alarming fact: OUR CHILDREN ARE NO LONGER PHYSICAL ENOUGH! releasing the body of excess energy, tension and frustration. Given the ages of the children attending Toddlers Workshop, few have the ability to actually play ball games like soccer, cricket, rugby, hockey etc. However, we want to make a difference to our children’s development by creating more opportunities to be physically active. Therefore, we will have a brand new theme for the second term: Let’s move! We will play with bean bags, bigger balls, smaller balls, balloons, a parachute and hula hoops. Even our creative activities will be physical! So, come prepared! Dress comfortably and make sure you have lots of energy! Together, we can make a difference. Get out your empty cardboard boxes and create an exciting maze. Use coffee tables, sheets, etc. Collect all your empty Styrofoam containers, spread them all over, switch on some lovely rhythmical music and start stamping the Styrofoam. Clean up by tearing the last bits and throwing them into the dust bin. Play a game of hide and seek. Toddlers usually use the same hiding place. Do not let that put you off. Be enthusiastic! They love the anticipation. Involve Dad and play a nice game of wrestling on the carpet. Close the doors leading to the passage and play Catch and Throw in your own passage. 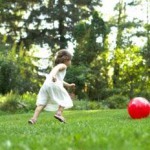 Play according to your child’s ability and forget about rules. Have fun. You will surely have a thrilled and tired toddler to put to bed. As a bonus you might just have a little more energy for your own bedtime gymnastics! Let’s get rolling. Life is too short to waste one moment. Please help me collect the following and bring them along on your visits to Toddlers Workshop: empty cardboard boxes e.g. cereal, tea, pills, etc., excess Styrofoam containers, the inners of your paper towels rolls, and your egg box containers. I will appreciate that and promise that we will have lots of fun. Mix 2 tablespoons of Maizena with water until it becomes a paste. Add a cup of water to it en slowly heat the mixture until it has the consistency of custard. Add a few drops of colouring en leave it to cool. Voila! Let the fun begin. 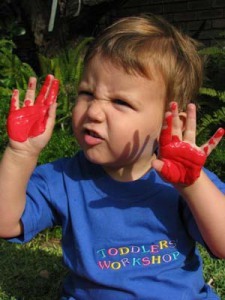 How messy play NOW can clean up his act LATER! How many of us say: “Let me see!” and then stretch out our hands to touch an object? We are all dependent on our tactile sense to interpret and engage with the world around us and to respond appropriately to touch sensations. The tactile system is the first sensory system to develop in the womb and develops from the same embryonic layer as the nervous system. It is able to function effectively when the visual and auditory systems are just beginning to develop. The skin thus plays an important role in regulating our nervous system, i.e. making us more alert or calming us down. It affects our ability to learn as well as our emotional and social well-being. This stresses the fact that without a great deal of tactile stimulation of the body, the system tends to become unbalanced. Playing with sand provides many learning opportunities. Rather than spending a fortune on plastic toys, you can, with a little effort, create a dream world for your developing child. A child can start playing in sand from the day he/she can sit up comfortably. The sooner you expose him to sand, the sooner he will get use to the touch of sand and learn to enjoy it. I can only see the red lights coming on when I speak about sand! Many parents at my workshops will not allow their children to play in the sand, as they will get dirty. 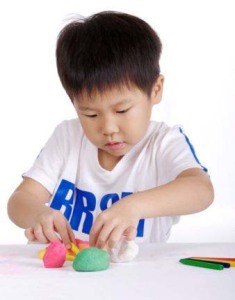 This approach might cost you a fortune on therapy once your child shows signs of tactile defensiveness and experience social and learning problems later on in life. There are far more benefits to sand play than dangers. Make sure you cover the sand pit so that the neighbor’s cats will not be able to use it as a litter box. I cover mine with shade cloth. Apart from that you can add hands full of coarse salt, bought at your local hardware shop or supermarket, to the sand pit to help preserve it from all sorts of bugs and germs. As in the case of with water play, sand play is most therapeutic to children, ranging from 6 months to 10 years or even older. Sand play is a right brain, non-verbal activity and can develop communication skills, thinking skills and problem solving skills. Sand play is also important for very active children and helps to increase concentration span. Whilst playing with the sand your child also develops important mathematical concepts. He/she experience the difference in wet and dry sand; experience the weight differences of the different buckets and spades as well as the differences in size and length of the different sand castles. My son started his engineering skills while building bridges and passes in the sand pit, trying to imitate the road to Cape Town. Apart from developing all these skills, sand provides excellent ways of stimulating imaginative play. Add a few farm or wild animals to it and leave them to create their own world. Make sure your child is covered with sun screen and has a hat on, as the time will soon go by. If you are not keen on the sand pit idea – be creative. Use an old ice cream container or even something bigger and hide some interesting things for your child to dig out from under the sand. During winter time an older child can start forming letters and numbers in a tray with a shallow layer of sand. Or let him draw pictures. Children older than three, three and a half years of age, might share lots of happy memories in the sand pit – sharing instruments and co-operating in creating a town, a jungle or a castle. Provide them with buckets full of water to add to the fun. Sand pits are also ideal places to have treasure hunts for children’s parties. Hide the treasure ahead of time and then divide it into zones. Each child has a little tooth pick flag with his name on and use this to pick his favorite spot. Everyone should then dig for their treasure. Have a little something in each plot for every child, but one big prize for the winner. In stead of hiding sweets that could lead to more hyped up party goers, you can hide plastic toy animals or even different puzzle pieces which they can use afterwards to have more fun. Be prepared to have sand all over the place. Life has become so busy, robbing us of all the wonderful opportunities that money cannot buy. Create a sand pit today and be sure to give your child one of the best gifts ever and one that will last many, many years. Playing with your child is not an option or a luxury; it is a must. 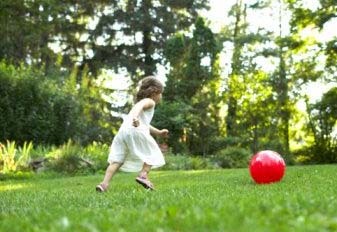 Play helps the child to relax and enjoy the flow of endorphins that make him feel good about himself and his world. It helps him to let go of all the stressors in his life. It teaches him about teamwork, taking turns and trust. Apart from that it is a wonderful way for family members to bond. It helps everyone to feel that they belong. Children love predictability. Decide on an appropriate time for playing, preferably daily, and stick to it, come what may. Create a family “Haka” (compare the All Blacks), a tune (like with soapies) or a song to announce play time. Switch off all cellular phones, the radio, television, play station, DVD player and start the game. Stay away from any electronic games. Play works best if there are no toys around! You may well ask: what shall we play? Think of the fun you had as a child and try different games until you can determine what works for your family. Keep it simple. It should create fun, not war! On rainy days you may make some play dough and create a zoo of animals or a garage where one can have your car washed and serviced! For sunny days it is best to be outside where everyone can do with a little bit of fresh air. Invest in different ball games, even for girls. Ball games help with the most important hand eye coordination skills. Create a sandpit and build roads, bridges, castles, towns. Over weekends the family can meet on the beach and play around in the rock pools or build sand castles. Play should always be finished with a calm down game – something that indicates that play time is now coming to an end. Everyone should help clean up. 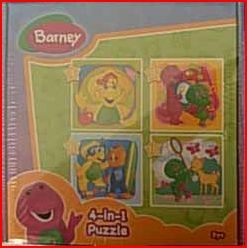 Use Barney’s song to have fun while cleaning up. Make the most of family time. Families that play together, stay together. It also helps develop those most important hand muscles necessary for later writing and working.